Blitz the porridge oats in a food processor for approximately 1 minute until they are quite fine. Add all the other ingredients and blitz well. Pour the mixture into a 2lb loaf tin lined with parchment. Bake in the oven for 1- 1¼ hours – lowering the temperature if baking too quickly. Beat the butter, icing sugar, cream cheese and orange zest together in a bowl and spread over the cooled cake. Put the jumbo oats into a bowl. Add the sunflower oil and honey and mix well. Spread on a baking tray lined with parchment. Bake at 150°C (300°F/Gas mark 2) for approximately 15 minutes until golden brown. 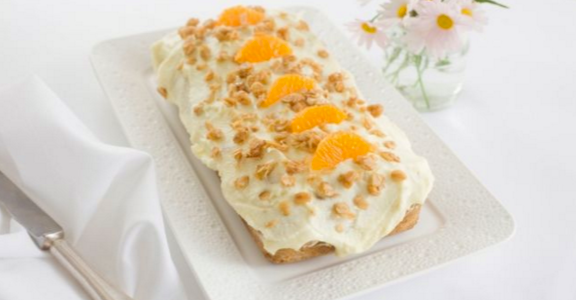 Sprinkle over the iced carrot cake and decorate with orange segments. The toasted jumbo oats can be stored in an airtight container and are delicious sprinkled over stewed fruit or added to yogurt.